Social Media & Internet Marketing Expert in Devenia Ltd.
Robert Ford is the American Devil Diplomat and his C.V. shows that he is the Bonfire Political Strife representative in the Middle East and the Engineer of civil wars in the Middle East. Ford is also known as the leader of the Fourth Column Generation, and the Ambassador of death. He was the main player in civil wars raised in Bahrain, Algeria, Iraq, Afghanistan, Libya and Syria. In July 2011, he visited the Muslim brotherhood Organisation main residence is Hama City- Syria, had a meeting with the Islamist Armed Militias, then the civil war started in less than two month in Syria right after his visit. Same thing happened in Bahrain, Algeria, Iraq and Afghanistan. In 2004- April 2005, Ford executed his mission successfully in Iraq, which was forming Islamist Militia Death Squad according to the Pentagon Program called”Salvador Iraq project”, and the main program target was forming Islamist Death Squad exactly like what happened in central America. He executed his program of raising the Sectarian Violence in the main city residence of Al-Mahdy Islamist Armed Group, Al-Nagaf City. In 2006, Ford supported the Death Squad and the Armed Militia Group in Algeria, and he was the main player in raising the Sectarian Violence in Algeria. Ford speaks German, Turkish, French and Arabic fluently, which served him great deal in communicating well with different political and Armed Islamist Currents. All Egyptians and All Political Currents in Egypt refuse Robert Ford as the new US Ambassador to Egypt, and already announced that publicly and to the Egyptian Government. Whether that nomination of Ford in Egypt is true or just a rumor, Egyptians already organized popular Campaigns against that nomination. And we are watching that news closely. The minute this news is confirmed, USA will see the same gathering of Millions of the 30th of June 2013, in all Egyptian cities going out and refuse that Ambassador. If US insisted on that nomination, all Egyptians will stop Robert Ford from passing the Arrival hall at the Cairo International Airport and put him on the same plan back to Washington. The message the Egyptians would like to send through that article is not just their refusal to that specific nomination of Robert Ford only, but to any other nomination of any American Diplomat who was involved in supporting and participated in any terrorists or Sectarian violence spreading in the Middle East. 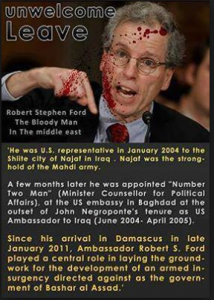 The following video is telling who is really Robert Ford and why he must be stopped from being the next Ambassador to Egypt.